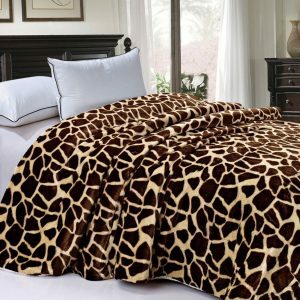 Primitive Bedding Sets, Comforters, Quilts, Throws, Pillows & More! Primitive bedding often has a country flare to it, as well as a vintage inspired look that will add warmth and design to your bedroom. Primitive country designs make for a charming bedroom theme that both men and women will enjoy. 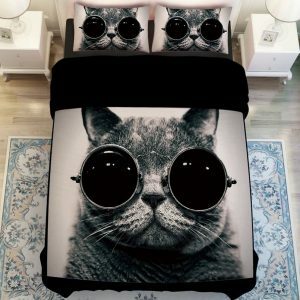 You’ll love the color combinations, as well as the quality of these primitive style bedding sets and other bedroom decor items that are highlighted here. 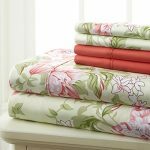 Primitive country bedding sets include comforters, quilts, throw pillows and more, all with a rustic design that will bring interest and style to your bedroom. You’ll love these primitive designs, and you’ll enjoy giving your bedroom a fresh, new look filled with country flare and rustic pleasure! 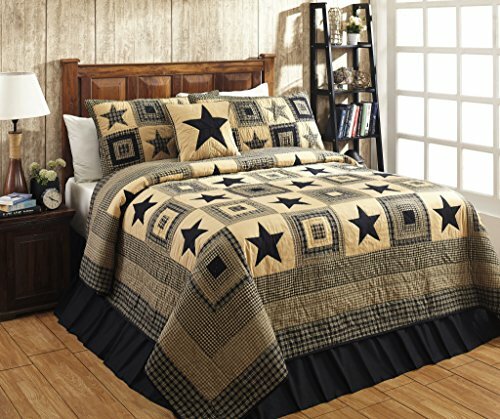 This hand quilted “Colonial” Country Quilt Set features black and tan in plaids and appliqued stars. Medium Weight for year round use. 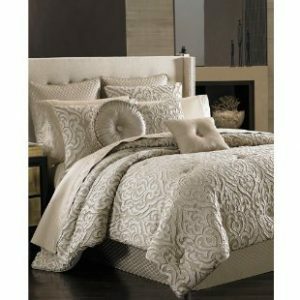 Each set comes with the quilt and two matching shams. (twin set includes one sham) 100% cotton and machine washable. 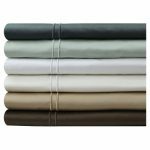 California King measures 120×105″ and comes with 2 king size 21×37″ shams; King measures 100×90″ and comes with 2 king size 21×37″ shams; queen/full measures 90×90″ and comes with 2 standard size 21×27″ shams; Twin measures 68×86″ and comes with 1 standard size 21×27″ sham. More accessories are also available. 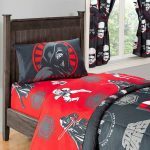 These star patch bedding sets are ideal for a primitive bedroom theme. 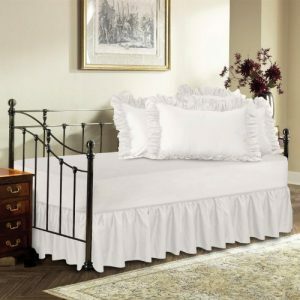 They have a country flare with a homemade look and feel, and will add warmth and comfort to your bedroom. 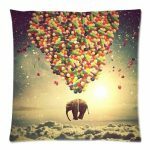 These are some of the most popular primitive bedding designs, and you’ll be more than pleased with any of these fine selections. 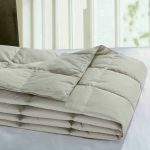 Come home at the end of the day and relax in comfort with our Cheston Patchwork Block Luxury King Quilt. The quilt measures 120×105″. The back of the quilt is made from a solid burgundy fabric. The main colors of this Cheston collection are burgundy and a slightly tea stained looking creme. 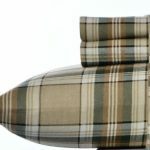 The 9″ patchwork blocks are made from various fabrics including a ticking stripe, plaids, checks and vintage prints. One of the vintage style prints is a tiny star pattern and one is a small floral print. Here are some lovely primitive bedding choices for your home! There are many colors and designs to choose from, so there’s something here for every taste. Each has a country feel, and will warm up your bedroom and your home. 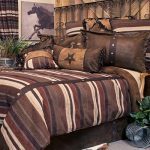 Simply click on the primitive bedding sets you’re interested in to learn what pieces are included, as well as pricing information and more. Your primitive bedding will look even better when you add matching accessories in the same colors, design or color scheme. It’s OK to mix and match prints, as long as everything flows well in the end. 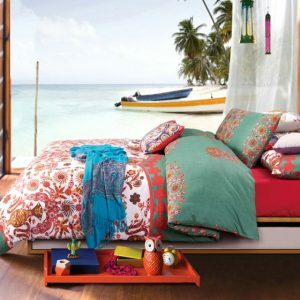 Consider curtains, rugs, throw pillows, blankets and more to accessories your primitive bedroom! These items will get you off to a nice start! 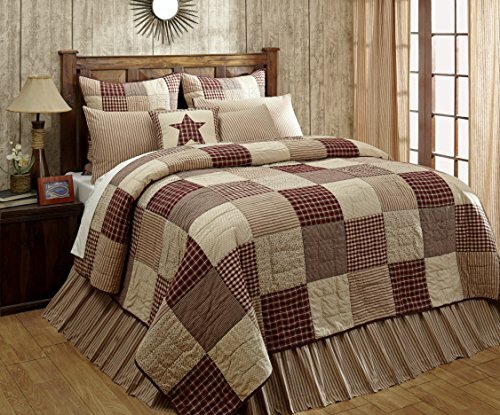 Town & Country is a luxurious Quilt Set with a vintage look! 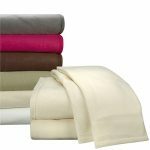 Includes 2 Pillow Shams with zippers, and is made of 100% fine Cotton, that is soft to the touch and easy to care for. The quilt is reversible. It offers two different patterns on front and back, allowing the option to flip any side you want based on your taste or mood. This gorgeous design is a combination of faux-patchwork and broad stitch work. 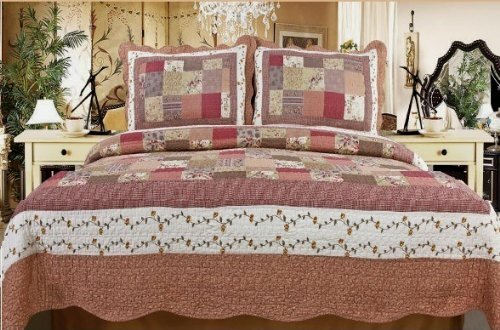 This Full/Queen size Quilt is also available in King size. It is not designed to offer a floor-length drop like in the picture. 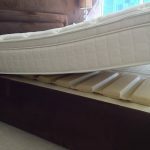 The picture shown in the listing uses a larger Quilt to better display the pattern, embroidery and colors of the quilt, not the length/drop of the Quilt as it varies depending on the mattress thickness and bed height. 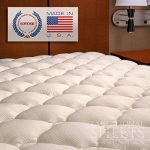 If you would like a longer drop, consider choosing the King size Quilt Set for your full or queen bed. Throw blankets are great decorating accessories. 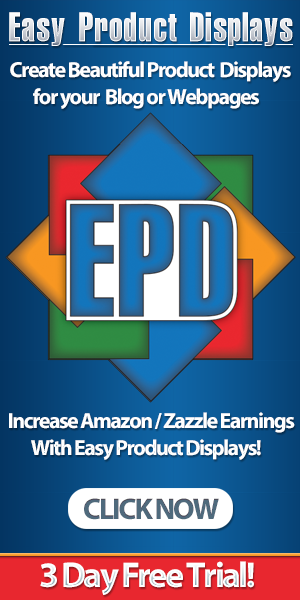 You can drape them over the back or side of a chair, on the back of a sofa or at the foot of your bed. 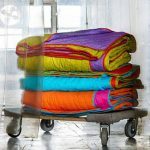 These primitive throw blankets offer a rustic country appeal that will go well with your other primitive bedding.